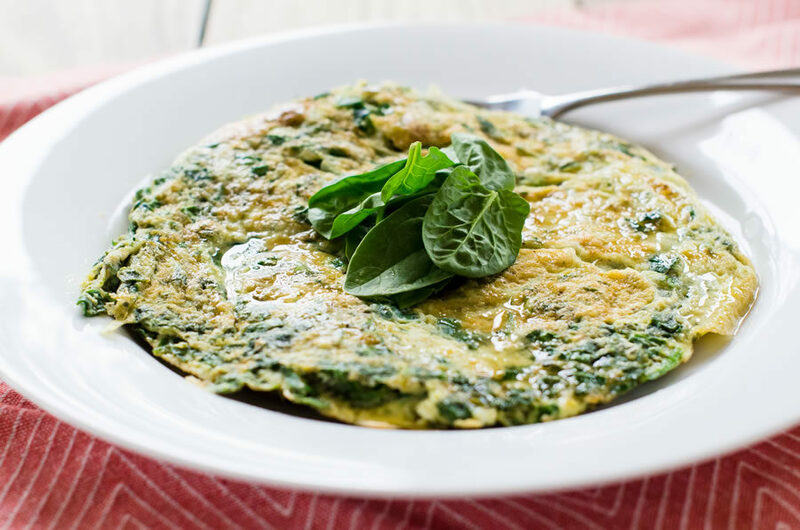 This "omcake" (a cross between an omelet and a pancake) is a beautiful "Deep S" breakfast, full of the detoxifying powers of greens. You won't come away hungry, and it can help your body release stubborn pounds or help you push through annoying weight-loss stalls. This recipe is found in the Trim Healthy Mama Plan Cookbook. Whisk eggs, egg whites, and seasoning in a bowl. Set large fry pan on medium heat and melt butter or spray with coconut oil. Pour omelet mix into pan and allow to cook until bottom side is slightly golden. Flip entire omcake over and allow to brown on other side until done. Slide onto large dinner plate then top with coconut oil and a small sprinkle of nutritional yeast. The Field of Green Omcake recipe and other delicious THM recipes can be found at www.TrimHealthyMembership.com. The recipe is part of our "Seven Day Video Menu" and our "As Seen On THM TV" series. You can watch Serene and Pearl make this recipe by tuning into THM TV!